The general consensus among website analytics experts is that 20% of tags on most websites for companies big and small are tagged incorrectly. 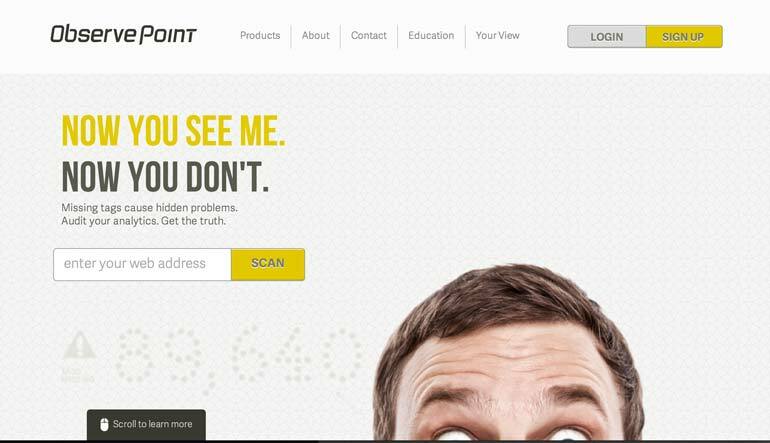 Provo, Utah startup ObservePoint has found that this discrepancy can amount to big losses for companies dependent on web traffic. The newest trend in web analytics companies are those that are doing “tag auditing”. ObservePoint is one of those companies. In a recent case study, ObservePoint found that they’ve been able to increase the amount a site can sell ad and banner space for by 100% simply because the traffic site owners are reporting is actually lower as a result of tag “mis-firings”. The same can be true for the other end of the spectrum as well. In some cases they’ve seen sites with up to 37% inflation because there are multiple instances of the same tag on a page that fire and then traffic numbers are inflated. As mobile and web advertising continues to increase ten-fold, media buyers are desperately looking for the most accurate traffic. To find that, there is a need to look past traditional SEO and directly to tag auditing, which is where ObservePoint comes in. ObservePoint founders Rob Seolas and John Pestana both come from solid web traffic and analytics backgrounds. Seolas was the co-founder of iLead Media an internet sales lead generation startup that was acquired by Think Partnership in 2005. Pestana was co-founder at Omniture which was acquired by Adobe in 2009. Now they’ve put their collective smarts together to help companies optimize not just their sites but right down to the tags. We got a chance to talk with ObsevePoint. Check out the rest of the interview below. When starting ObservePoint both founders Rob Seolas and John Pestana set out to solve the problem of correcting the accuracy in online marketing and web analytics data. Each founder had a solid background in understanding how companies measure web traffic and produce web leads. ObservePoint is located in the Silicon Slopes, or more officially Provo, Utah. Provo is a city about an hour south of Salt Lake City, which has a vibrant start-up community. It was been named to a number of business lists as a top place to start a business. Forbes named it at the No. 1 place for business and careers. Provo’s technology and start-up pedigree runs deep and many of the area’s tech startups can be linked to Novell and WordPerfect. Since the Novell and WordPerfect days the Silicon Slopes – a name coined by John’s previous partner and Omniture co-founder, Josh James– there have been hundreds of tech companies that have launched and gone on to be acquired by bigger out-of-state companies or private equity. In the past six years that list includes Altiris (by Symantec for $800M), Omniture (by Adobe for $1.2B), Ancestry.com (by Permira Funds for $1.6B), Vivint (by Blackstone Group for $2B), among others. In addition to the acquisitions, Angels and VCs have been active and investing heavily in Provo-area companies like Qualtrics ($70M), InsideSales.com ($35M), and Domo ($125M) to name a few. Other non-Utah-based companies like eBay, Adobe, HP and American Express have established significant presences in the area. Add the fact that Google Fiber recently chose Provo, and it’s been a pretty good year for the region. Most web analysts know that their analytics data is dirty, but they either don’t know how to detect and clean it up or they know they and their superiors have come to expect it and sweep it under the rug. A major hurdle is the thousands of hours it would take to go through each page to check AND test each tag to make sure it is firing correctly. At least that’s how it was before ObservePoint came around. What we’ve found is that on average, websites have a 20 percent error rate in their web analytics data due to tagging problems. When we tell a web analyst they show us the tags and proudly state that the tags are there. However, they don’t really know whether the tag is firing and reporting the data accurately. In addition to tags not being present or firing on the page we have found that some sites have a huge inflation rate because of tag duplication on one page and each of them report that as unique traffic. This inaccurate data is troublesome because companies are basing major decisions on this information. ObservePoint automates the auditing for all the tags on a website. We run a thorough scan of the site and test each tag to make sure it is firing. After that we present reports of the pages that have problems so they know what they need to fix. The idea and the development and testing of the technology started in 2007. However, we believed that the issue would become more prominent in the next few years and that foresight is paying off because companies are starting to realize that they can’t continue to make decisions based on bad data. Also, the tag management space has shone a bright light on the headache that is managing each tag. Companies are starting to add a tag management platform, but that can create a false sense of security when it comes to data quality. Really, tag management platforms need to be audited the same way an analytics tag does to ensure that data is collected correctly. We are called into a lot of new tag management implementations to audit them and companies are shocked when they find that the tag management system hasn’t solved their data quality issues. Besides having record revenue years, one of our major milestones happened earlier this year when we were invited into Adobe’s Enterprise Solution Partner Program. That was a big step and one that John and Rob hoped would happen since the beginning. On the technology front, we’re working on adding the #1 requested capability – that is to audit tags that fire on click. (Currently, only page-load tags are catalogued.) This requires some major back-end technology changes, and that will add a new and improved user interface, better performance, comparison to historical data, and a slew of other features. People can also learn more through our social media sites: Facebook, Twitter, and LinkedIn.